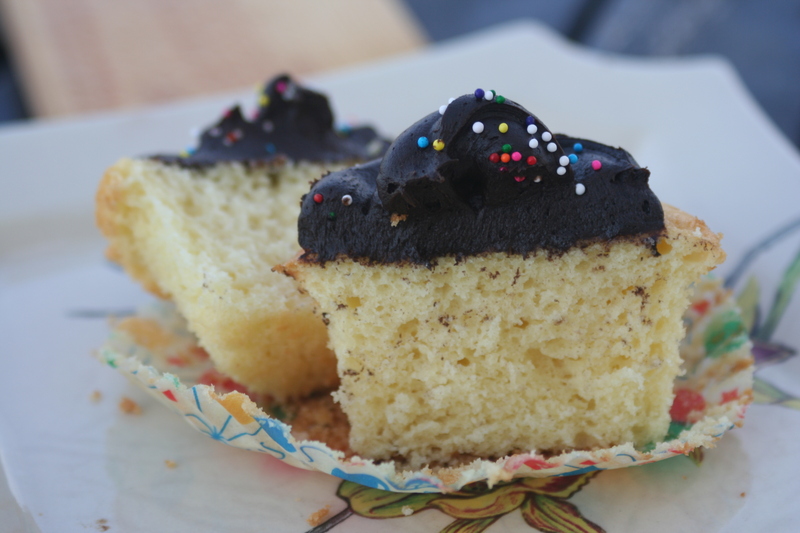 This week, I set out on a mission to find a vanilla cupcake recipe for my oldest son's birthday. It wasn't as easy as it sounds. Reviews on nearly every vanilla (or white) cake recipe are mixed - some love it, some hate it, some think it's light, some think it's dense...you get the idea. And let's be honest, not everyone is a competent baker, so it's hard to know which reviews to trust! Finally, I deicided to just jump in and try a recipe. Bobby Flay had one which I adapted to work for me. The texture was lovely and the flavor was quite good. The chocolate frosting he included was delicious as well - a frosting recipe unlike any I have ever made. These definitely got the seal of approval from my family and the birthday boy loved them! They would also make a beautiful Easter or spring dessert. Adjust the oven rack to the middle position and preheat the oven to 350 degrees F. Fill muffin tins with liners . Whisk the flour, baking powder, baking soda, salt, and 1 1/2 cups sugar together in a large bowl. Whisk together the melted butter, buttermilk, oil, vanilla, and yolks in a medium bowl. In a clean bowl of a stand mixer fitted with whisk attachment, beat the egg whites at medium-high speed until foamy, about 30 seconds. With the machine running, gradually add remaining 1/4 cup sugar; continue to beat until stiff peaks just form, 30 to 60 seconds Transfer to a separate bowl and set aside. Wash the bowl and dry. Add the flour mixture to the now-empty mixing bowl fitted with the whisk attachment. With the mixer running at low speed, gradually pour in the butter mixture and mix until almost incorporated (a few streaks of dry flour will remain), about 15 seconds. Stop the mixer and scrape the whisk and sides of the bowl. Return the mixer to medium-low speed and beat until smooth and fully incorporated, 10 to 15 seconds. Using a rubber spatula, stir 1/3 of the whites into the batter to lighten, and then add the remaining whites and gently fold into the batter until no white streaks remain. Fill the cupcake molds 3/4 full and bake until just firm, about 18-22 minutes. 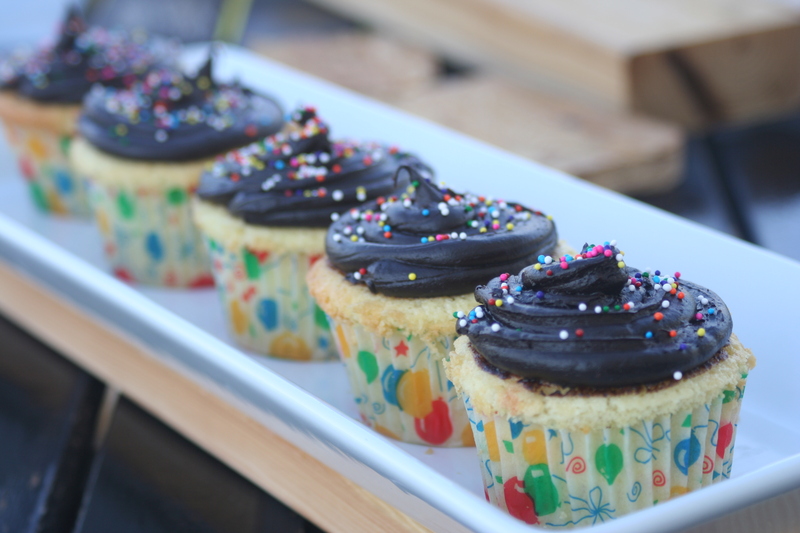 Let cool and frost with Creamy Chocolate Frosting. Decorate with sprinkles, if desired. In a food processor (or using a mixer), process the butter, sugar, cocoa, and salt until smooth, about 30 seconds, scraping the sides of the bowl as needed. Add the corn syrup and vanilla and process until just combined, 5 to 10 seconds. Scrape the sides of the bowl, and then add the melted chocolate and espresso and pulse until smooth and creamy, 10 to 15 seconds. These look so delicious. The frosting especially looks tasty.